In 2003 the second season winner of Matt Damon and Ben Affleck’s attempt to give back to up-and-coming filmmakers was Kyle Rankin. Since his feature film co-directing debut of Project Greenlight’s The Battle of Shaker Heights, Rankin has found a niche in horror comedies with 2009’s Infestation and 2015’s Night of the Living Deb. His latest horror helmed feature leaves the comedy behind for teenage angst. 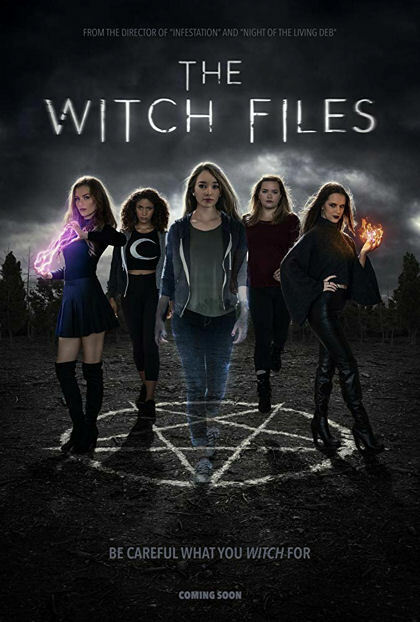 A first person filmed high school horror drama, The Witch Files is Twilight for witches without the love story. The first person filming is barely noticeable which is a great compliment to Rankin as a director. The filming style is more television than feature film but never-the-less looks good even when a static camera is used to cover a lack of budget for effects. The coven of youthful actresses does a fine job incuding up-and-coming Tayla Fernandez, Sara Friedman, Holly Taylor, Tara Robinson, Adrienne Rose White and Alice Ziolkoski. I don’t think a middle-aged horror critic is the target demographic for these Charmed teenagers. A tween horror audience may find this one a little more appealing, particularly a female emo crowd.